Today is Perfect Picture Book Friday where I link up with Susanna Leonard Hill’s fantastic group of writers who contribute a picture book review and related resources every Friday. But first,I want to announce the February PPP Reading Challenge picture book winner. It was lovely to see what some of you were reading to your children. I know how difficult it is to find the time to post your comments. And the winner is….AngelaMarie…she is a very talented poet and artist as well as a mom. Please take a minute and visit her beautiful blog: One-In-Creation. And now, on to my Perfect Picture Book Friday selection. – This is author Lucille Clifton’s eighth book featuring a thoughtful, small black hero facing the everyday problems of growing up in a complex world. Here, sotto voce, she confronts the problem of child abuse as Everett Anderson makes a new friend at school and worries because, daily, Greg arrives with a new scar or bruise mark on his leg. Everett could tell his teacher, but “I’m afraid in case he asks me what I mean and I don’t know exactly.” He also doesn’t want “to make it bad for Greg or for his mom and dad.” Everett’s mother counsels her son to listen to Greg “and hug and hold his friend.” And the listener to this affecting tale has the feeling that Everett’s mother may try to help Greg in other ways. This is a book that could prove invaluable in initiating classroom discussions of a widespread problem that deserves wider recognition and attention. The illustrations are soft and compelling. The text breaks your heart and makes you want to go out and save every unfortunate child who has to deal with abuse. This is a widespread problem in our society…here is a book that can open the door to discussion and honest revelations. We can empower young children, not only to speak up for themselves, but also to reach out and help others. Children love making their own books. An activity like this one builds reading readiness skills in very young children and develops stronger literacy skills in older ones. You will need: One piece of construction paper, two or more pieces of white copy paper, markers or crayons, stapler or hole puncher and ribbon. 1. Fold the construction paper in half…this is the cover for the book. Help your child write the title of his book on the cover. 2. Fold the pieces of white copy paper in half…insert into the cover and staple along the folded edge or use the hole puncher to make two or three holes through all the papers and string a piece of ribbon through and tie to hold the pages together. 3. 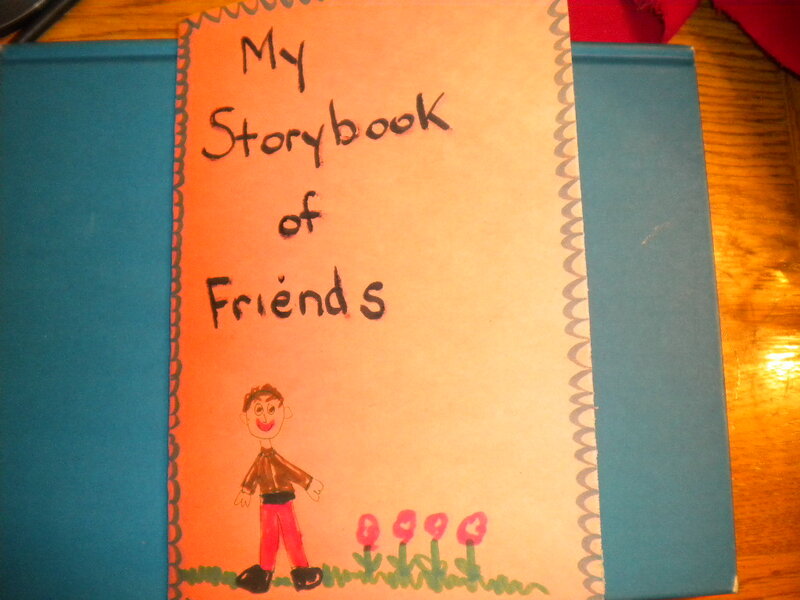 Your child is now ready to make his own storybook of friends. Encourage your child to draw pictures of his friends on each page. 4. Ask your child to tell you his story. Children really get a thrill out of making their own books. You can use this bookmaking activity in many other ways…have your child cut out pictures from magazines of foods he or she likes, animals, etc. 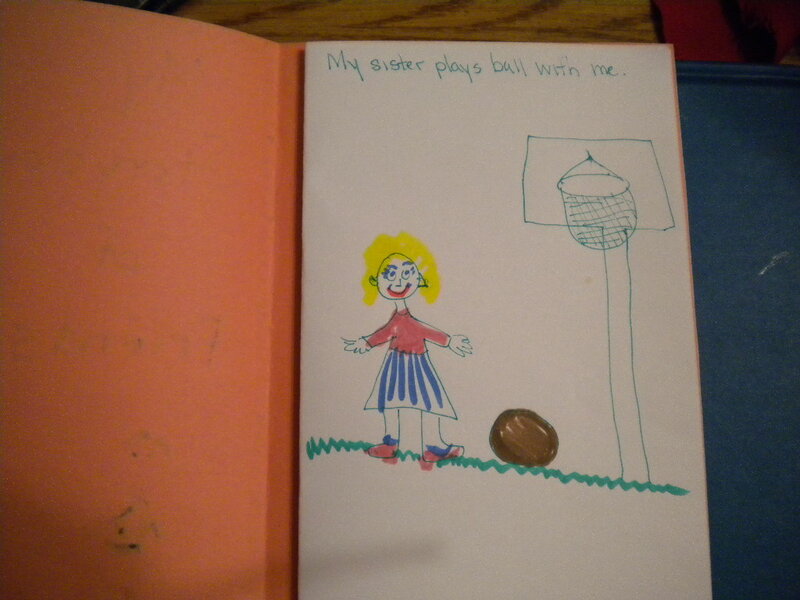 Your child will have a collection of handmade books that he or she can read to you. Puppets definitely lend themselves to role-playing and could be used for a follow-up discussion of the book. Young children love flannel board stories…teachers or counselors can encourage children to discuss this issue using flannel board figures. This entry was posted in child abuse, children's picture books, Crafting with Children, Perfect Picture Book Friday, Reading with Children and tagged Lucille Clifton, Picture book, poet laureate by viviankirkfield. Bookmark the permalink. What an important, moving, needed type of story, this is a great find. The author chose well to write it from Greg’s friend’s point of view. Thank you, Vivian, for highlighting this book. Yes, I’m so glad this book will be part of the PPBF resource list…I know it is one that parents and teachers will find helpful. 🙂 And, even though it is a “scary and sad” book, as Erik pointed out, it will encourage children who are being abused to come forward and speak out…and realize they are not the only ones this happens to, that it is not their fault, and that what they are experiencing is not how it should be or must be. :). Oh, hooray!! I am so perfectly delighted by this! Thank you so much for the book and for your kind words. You so truly made my day. Today is “car-rider-Friday” day at my house, which means that my son does not have to go to After Care. I pick him and his best friend up each Friday right at the bell, and we have a play date. I hadn’t planned an activity for today yet — so I think now we will make our own books! I’ll let you know! I am just so excited to win the Positive Parental Participation reading challenge for the month of February! (We will receive a picture book!) Check out this wonderful blog by Vivian Kirkfield, and if you have little ones- follow along! It’s a wonderful place of discovery! Vivian, this is an important book to add to our list. It sounds like it is for a little older kids, but even young children suffer abuse. Great discussion book for parents and children. Great activities for kids to express themselves. You always post the most thoughtful and detailed activities, Vivian. This is an important topic that doesn’t get much air time in children’s lit. Thank you for sharing this book! Thank you, Amy! I love finding books that share important messages…there aren’t many books that address this issue, so I was glad to find this one. 🙂 Happy you like the activities as well! Once again, your activities are wonderful. This story sounds wonderful. I have already checked for it online at my library. They have it. Yea! Oh my gosh, I lived near St. Mary’s years ago. I love the local connection and will definitely find this book. WOW, Kirsten! What a small world! And my younger son applied to St. Mary’s College, but the financial package was better at York College in PA, so he went there instead. Thanks for adding this to the list. It sounds too old for my little guy for now. I love the activity. You are probably right, Stacy…but the illustrations are quite lovely. Maybe when Enzo gets a little older. It’s definitely an important topic to address…and we can empower our children by talking about it. I am so glad you shared this book today, Vivian. I can’t believe it, but I really can’t think of a single other PB title that addresses the issue of child abuse. I am glad to be adding it to our list for children out there who need this kind of book. I’m always thrilled when I can add a book that expands the topics on your PPBF list. 🙂 And I think it is a wonderful book, not only for kids who are experiencing abuse, but for their classmates and friends who can step forward and speak up if they observe or suspect a problem. A good choice to add to the list. The range of topics covered by children’s books always amazes me and this is an important one for kids. I love your activity, as well. Thanks, Heather. I love coming up with arts and crafts projects that relate to the picture books I read in school programs. I agree, Robyn. This is a wonderful book for school libraries…every classroom should have a reading of it…and then perhaps an activity. Each class could do a puppet show and/or individual books…the puppets would be great as they would encourage role playing. This book sounds super sad. Maybe Everett didn’t understand what was going on? I think that would be a scary situation. I think I’d tell my parents about it, though. You are right, Erik…this is a super sad book and if you ever had a scary situation, the best thing would always be to tell your parents so they could step in and figure it out. 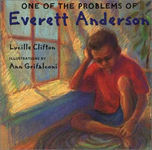 And that is what the little boy finally did, so we hope that his friend, Everett, will get the help that he needs. Thank you, Marcy! Kids have so much to say…I love encouraging them to talk about it and then write it down. Creating our own characters or telling a story with known characters, we love making books around here. This is an extremely important book Vivien, with an even more important message. Loved your idea of making the books with kids. I always with our niece and nephews when they come to stay end up having them go home with a scrap book of all the things they did, while on holiday with us. Making the book is a cool idea, thanks for that. Diane…what an excellent activity for your grandkids…making a scrapbook of their time with you is awesome! What a treaured memory for them (and you)! Glad you liked the book…it is so sad, because we know that this is an all-too-common situation for many children…in all different social, ethnic and economic groups. 😦 What is the solution? What a valuable book — thank you for sharing. I love your suggested activity too — will have to try this for my daughter, who is really in to giving me story ideas right now. It would be so cool if she could make her own book! How old is your daugher? I’m sure she will love making her own books. Thanks for your selection for PPBF this week. Thanks for introducing us to this book. I love your activities to with it. Thank you so much, Clar. How did you have time to do all of this? I love the topic for this book. Thanks for sharing.